"Physics Tools Extension" provides some additional blocks for working with the Box2D environment. It includes tools for precision trajectory calculations and collision detection on a curved path. You want an actor to jump exactly 6 tiles across and 4 tiles high. 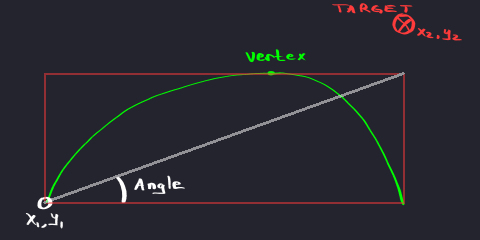 What should you set the velocity and angle to? 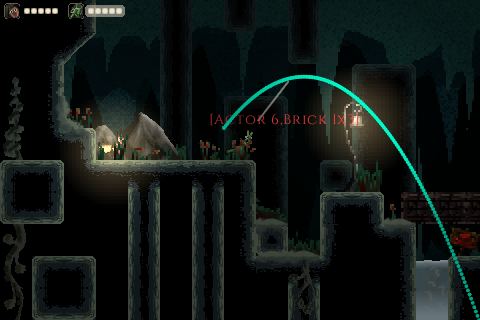 You want an enemy actor to fire at your player using a curved path. Will it be able to, or is there an obstacle in the way? You want an enemy actor to jump at your player. How much force should it use to jump? You want to draw an arc that shows what path a projectile may follow. The extension can be downloaded here (.zip), here (.tar.gz), or from my site (.zip or .tar.gz). A sample project file can be downloaded here or from my site. Please see: How to Install and Update an Extension. Documentation is provided below. The documentation can also be found on my site. Returns the first actor on the trajectory from x, y at given velocities. The time interval (see illustration below) will specify the section of the arc to search for a collision within. Returns a list of all actors on the trajectory from x, y at given velocities. The time interval will specify the section of the arc to search for a collision within. Returns the projected x or y position of the actor n seconds into the future. Returns the x or y speed necessary to launch a body from (x1,y1) to (x2,y2) at an angle of n degrees. Note: "angle" is used to determine the highest point the projectile will reach before it descends. The image below illustrates the effect "angle" has on the path. A rectangular box is drawn, the width of which is the horizontal distance between the projectile and target. The angle between the two diagonals determines the height. To form a trajectory that is as high as is far, select an angle of 45 degrees. Launch an actor to a specified point. The "angle" parameter behaves as explained above. Returns true if the "angle" parameter, as used above, is sufficient. In some cases, the "angle" parameter may be too low for the computed trajectory height to reach the intended target. In this case, two errors may be seen if a launch is executed: "PhysicsTools.launchVelocity: Negative discriminant." or "PhysicsTools.doLaunch: Angle insufficient to reach target height." This block allows the developer to check for this condition before attempting a launch. Returns the horizontal speed (x) or vertical speed (y) component of velocity in a given direction. Returns the angle formed by the diagonal connecting (x1,y1) and (x2,y2). Returns the first actor on an arc from (x1,y1) to (x2,y2) at specified velocity. Returns a list of all actors on an arc from (x1,y1) to (x2,y2) at specified velocity. Returns the angle of motion to hit a target at (x2,y2) at a specified velocity. Beta release notes: These ten blocks solve the problem I had in my own game (that motivated this extension) and some problems I remember from browsing the forums over the past few months. I can add more if requested. One block you will not see is a simple "launch from point A to point B". 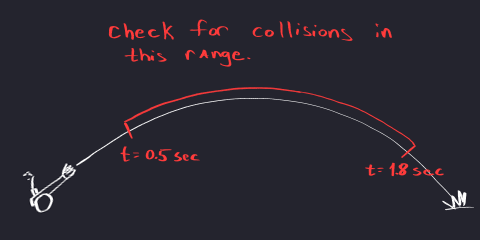 The reason is that more information is needed to determine a trajectory: either the length of time the projectile will take to complete its flight, or the highest point the projectile will reach. I chose to implement the latter, in the form of the "angle" parameter, since it should be easier to visualize. 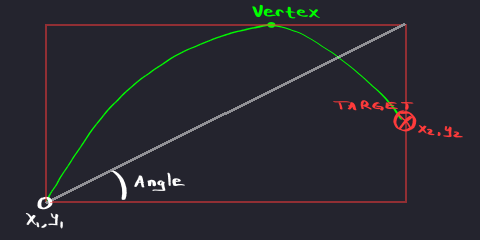 "angle" essentially determines the aspect ratio of a box the arc path will reside in. (e.g. a 45-degree angle gives a 1:1 ratio of distance horizontal to distance vertical). You linked the tar.gz file in the link you posted here. Great job with this one! It will come in handy. Thank you! Another useful gem for my collection. I can add more if requested. I am really surprised by the accuracy and good performance of this extension when drawing paths. It is an excellent extension. I only miss the block that I mentioned in my previous post. Thanks! I added a direct link to the .zip file. I updated the package today. It now includes this block. Really? Thank you very much!!! This is absolutely helpful! I'm really glad you shared this wonderful stuff. How can we download the Beta Release 2 ? When I use the links in your first post, the old Beta Release 1 is downloaded and the new blocks don't appear. Whoops!-- I refreshed the files the links point to, so it should work now. I also need to change the rest of the 10 constants to the proper functions-- toPhysicalUnits and toPixelUnits. It shouldn't be an issue for now, but if Stencyl ever changes the constant as defined in the engine, then the beta release 1 and 2 versions won't work. Glad to hear it's been helpful! I also need to change the rest of the 10 constants to the proper functions-- toPhysicalUnits and toPixelUnits. Please, let us know when they are changed. I would not like this useful extension to stop working someday. @merrak, Oops! After uninstalling the Beta Release 1 and installing the Beta Release 2, the sample game shown in my previous post doesn't work, and "Clean Project" doesn't solve the problem. I was about to ask myself how that slipped through the cracks, since it compiled fine on my end when I tested it. I realized I must have packaged the wrong file, since it also had the angles for the two new blocks in radians--instead of degrees. Sorry about that. I updated the link again. The correct .hx file has the angles for the two new blocks in degrees. 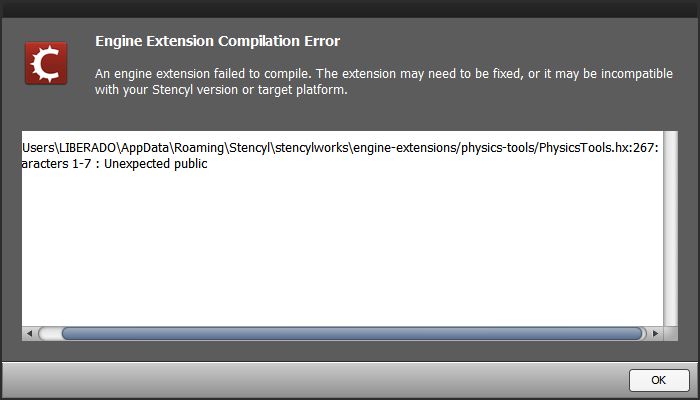 You should be able to drop the new .hx file in without restarting Stencyl. I didn't need to update the blocks.xml file.